Maize contaminated with aflatoxin has been linked to extremely high rates of malnutrition and child mortality in Sub Saharan Africa (child stunting - 34%; child mortality - 75 deaths per 1000 live births). Aflatoxin is a dangerous carcinogen from toxigenic mold species of Aspergillus flavus and A. parasiticus, which naturally inhabit soil around the world and favor high heat and humidity. Contamination in maize is a serious food safety and public health risk in SSA, where more than 300 M people depend on the crop as a staple food source. Based on estimates from health economists, the total future non-health GDP loss from death of children under 5 years old in SSA is about $140 B (International $) per year ($50,494 per child death). Dietary aflatoxin exposure in SSA may be linked to up to 440,000 deaths of children under 5 each year (15.75% of total child mortality), and about $22B of lost future GDP. The World Bank. World Bank Open Data. https://data.worldbank.org/. International Livestock Research Institute. Corporate Report, 2014-15. pg. 31. Feed the Future. Agrilinks. Aflatoxin Infographics and Related Sources. https://www.agrilinks.org/post/aflatoxin-infographic-and-related-resources. Paul Turner, et al. (June 2007). 'Aflatoxin exposure in utero causes growth faltering in Gambian infants.' International Journal of Epidemiology 2007; 36:1119 – 1125. Yunyun Gong, et al. Determinants of aflatoxin exposure in young children from Benin and Togo, West Africa: the critical role of weaning.' International Journal of Epidemiology. 2003 Aug;32(4):556-62. World Health Organization. Children: reducing mortality. https://www.who.int/news-room/fact-sheets/detail/children-reducing-mortality. Joses Kirigia, et al. 'Counting the cost of child mortality in the World Health Organization African region.' BMC Public Health (2015) 15:1103. Aflatoxin contaminated corn. Often the contaminant is within the kernel and not visible to the naked eye. 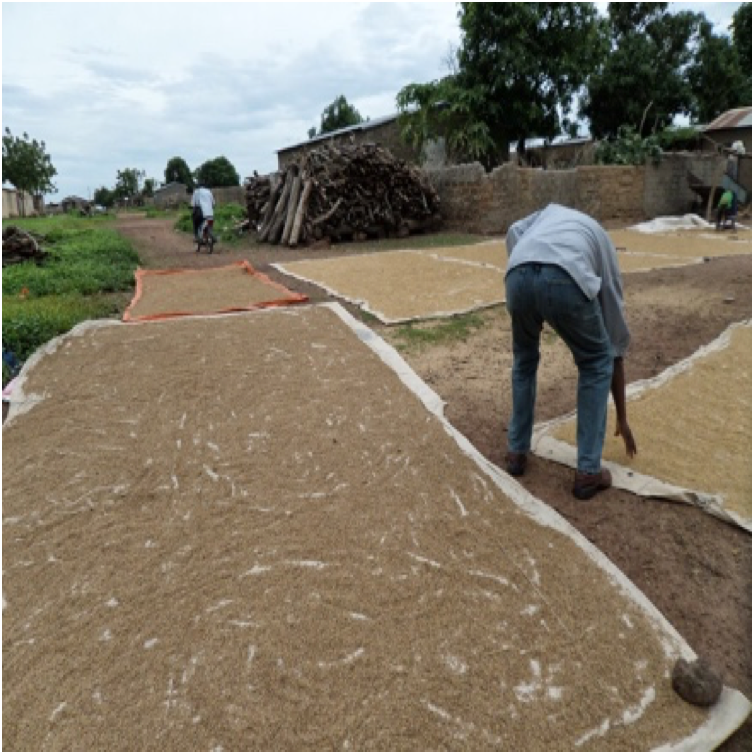 In many developing countries farmers dry their corn in the open air, or on tarps, further enhancing aflatoxin-related fungal conditions.